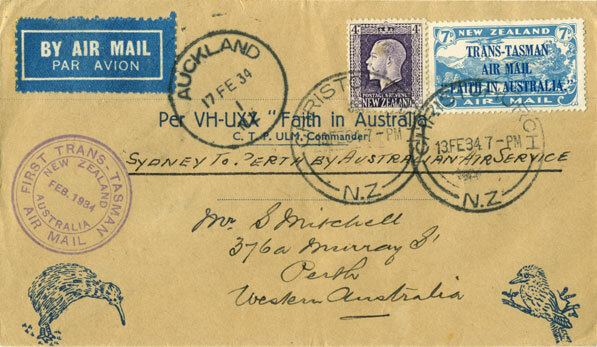 The first official airmail between New Zealand and Australia took place on 17 February, 1934. The Avro 10, Faith in Australia, left Muriwai Beach, Auckland at 6 am and arrived in Sydney 14 hours 10 minutes later. Charles Ulm was the pilot, Scotty Allan the navigator/co-pilot and R.T. Boulton was the engineer. The postage rate was 7d made up of 1d surface rate plus 6d airmail of which 4d went to Ulm. An airmail of 39,255 items was flown and a special cachet was applied. Covers were backstamped on arrival in Sydney. A special printing of the 7d airmail stamp in sky blue was issued for the flight. 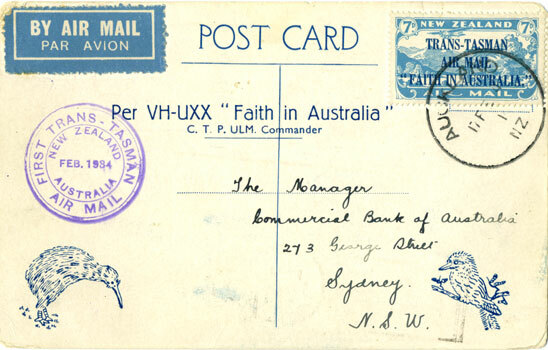 It was overprinted with the slogan: Trans-Tasman Air Mail "Faith in Australia" on three lines. The cover is addressed to the USA with the onward journey from Australia by sea. There are faint cancellation bars over the aircraft in the top left which could be a Jusqu'a cancellation to indicate that there was to be no further carriage by air after Sydney. A large number of special covers were produced for the flight. The great majority were printed in dark blue on manilla envelopes and an estimated 35,000 of these were flown. This example is one of the 12,860 boomerang covers and carries two 1d Australian stamps to pay for the return from Sydney to New Zealand by sea. The special airmail stamp has the 'break in the left hand stroke of the N in IN' flaw in the overprint that occurred in the fourth row of each sheet. The cover has a different backstamp from the first example. Three different backstamps were applied in Sydney and each is shown in the examples on this page. Again there are vertical bars cancelling the air mail etiquette. A small number of covers had the same design in light green or in blue, but on white envelopes. Others had the design printed on the reverse side of the special postcards flown to New Zealand by Ulm on 3 - 4 December 1933. In addition, special covers were produced by the Wakefield oil company whose Castrol products were used by Ulm in all his flights. These covers were signed by Ulm and, according to the literature, were numbered in the lower left corner. As far as I can gather, the covers addressed to Australia are numbered while those, like this one, addressed to London are not. This example is addressed to the UK and has an extra 7d stamp as it was also flown on the Karachi - London service on 15 - 22 March. 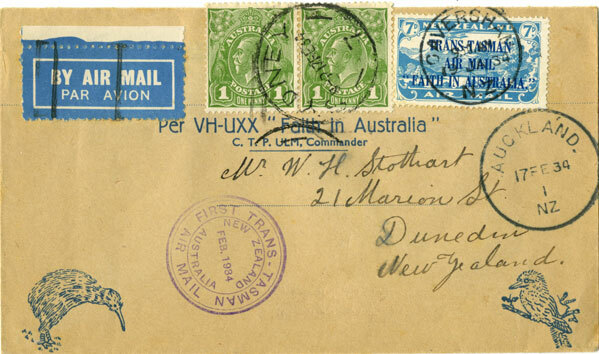 The next cover is addressed to Perth and has a 4d stamp to pay the airmail postage from Adelaide to Perth as well as the 7d trans Tasman airmail. It has a different Sydney backstamp and the Perth backstamp shows that it did not arrive there until 25 February, 8 days after arrival in Sydney! The next cover is routed Adelaide - Perth and Karachi - London and so was carried on three separate airmail services. 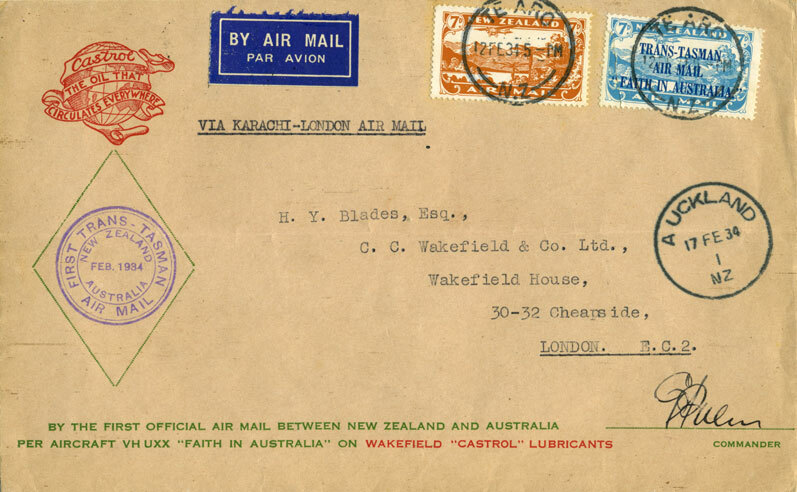 In addition to the Trans - Tasman 7d, it has a 7d stamp for the Karachi - London air mail and a 4d for the Adelaide - Perth airmail service. After being flown Adelaide - Perth on 24 - 25 February, it connected with the S.S. Ballarat from Fremantle on 26 February. It was then flown on the IA flight that left Karachi on 15 March and arrived in London on 22 March . 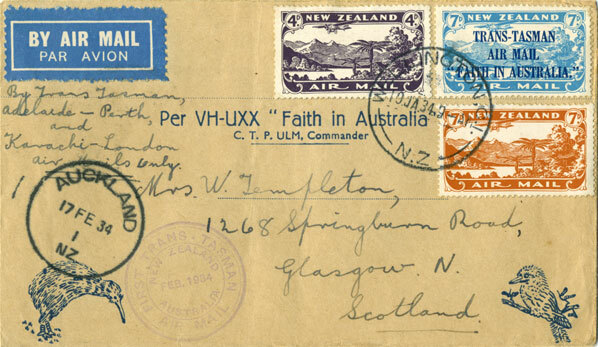 This cover has a manuscript on the back stating that it was received in Glasgow on 23 March and so was 34 days in transit after leaving New Zealand. (As it is postmarked Wellington on 19 January, the total elapsed time is much longer.) A cover to the same address sent via US airmail around the same time was only 30 days in transit. 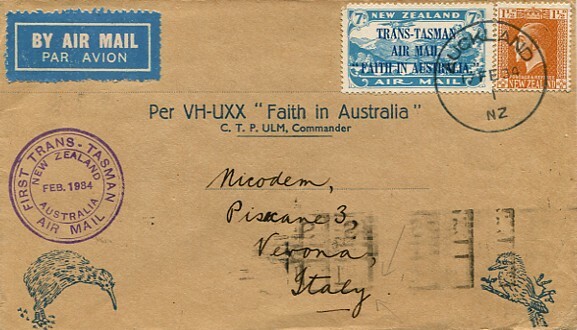 This cover to Italy is postmarked in Auckland on 17 February and has the normal Sydney backstamp later on 17 February. It is franked with 8½d made up of 2½d surface to a non Empire country and 6d airmail. After arriving in Sydney, it would have been sent to Perth by train and connect with the S.S. Ballarat from Fremantle on 26 February. It is backstamped in Italy on 24 March which is the same day as the ordinary mail from the S.S. Ballarat reached London. The Faith in Australia had previously been owned by Australian National Airways which was liquidated in 1933. Charles Ulm bought the Avro Ten Southern Moon from them. As he planned a round the world trip, the plane was modified so that it could make long distance journeys and was renamed Faith in Australia. 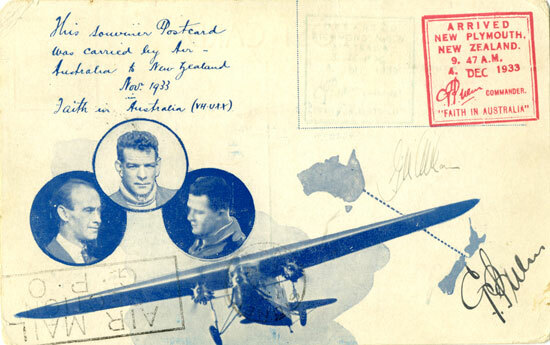 Ulm, Allan and Boulton had flown the Faith in Australia from Sydney to Bell Block airport, New Plymouth on 3 - 4 December 1933 carrying a small unofficial mail, mostly postcards. 100 of the cards were also flown on the return flight of 17 February. Both sides of a card, flown both ways and signed by Ulm and Allan, are shown. 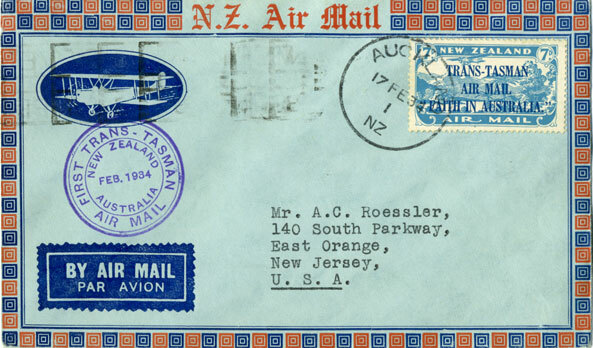 Their aim on arrival in New Zealand was to persuade the Postal Department to authorise an official airmail on the return journey to Australia. To raise funds and to generate publicity, they made a "barnstorming" tour of New Zealand with the Faith in Australia which included a non-stop airmail flight from Auckland to Invercargill on December 12. The 50th Anniversary of this flight was commemorated by an Australian issue in 1984. It shows Ulm, the Faith in Australia and a signed cover. 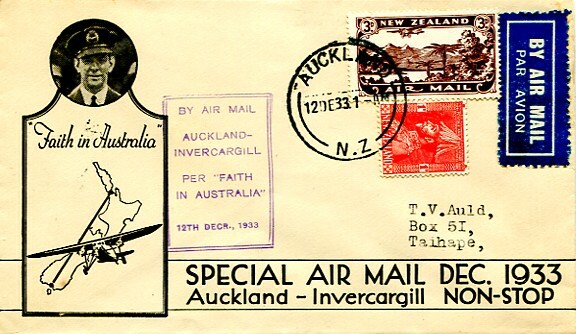 Three further official trans-Tasman airmail flights were made from New Zealand in 1934, but there were then no further successful trans-Tasman official airmail flights until 1940. Airmails of New Zealand, volume 2 (1986) compiled by Douglas A Walker, and The New Zealand Airmail Catalogue, (2nd Edition, 1994) by James Stapleton. W.H. Legg, Aspects of the London-Karachi and the Perth-Adelaide Routes, Air Mail News, vol 44, pp 106-116, August 2001 and pp 178-183, November 2001. Aircraft Movements on Imperial Airways' Eastern Route, Vol 1, 1927 - 1937, Peter Wingent, Winchester 1999.